I do a lot of testing, particularly with FR32 lamps using either 4 or 6 lamps. Because of this, I built my own curing rig. Now, in some ways, it is probably overkill, such as the electrical connections. I made it so I can swap out ballasts and such easily, something you won't be so worried about. But still, it serves as a good example of how easy it is to build a device. I got fancy with the leg hardware and such, and still spent less than $25 for the whole thing, not counting ballast and lamps. Here is the basic view. I have it about 6 inches off the table top, but you can also use risers to move the items closer to the lamps themselves. 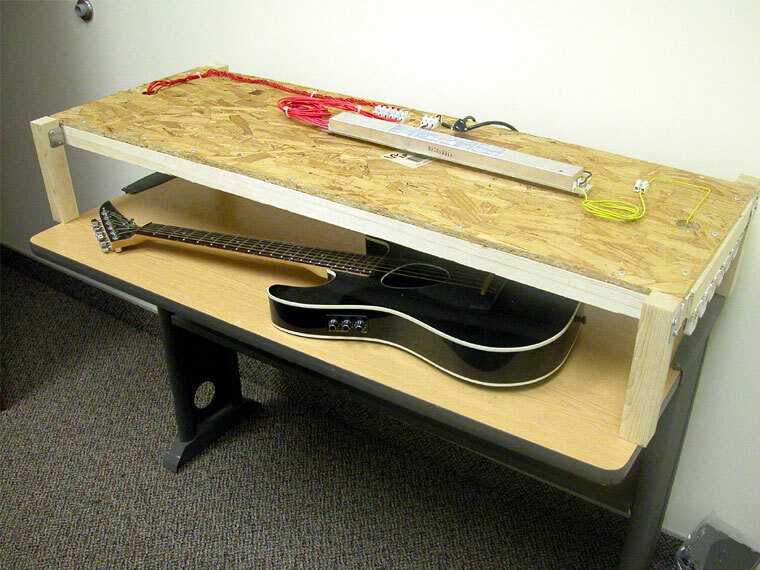 Note that I put the ballast on top of the rig, to isolate the heat and make maintenance easier. I also shimmed the ballast, using a couple of washers to lift it off the wood frame, allowing it to cool better. This particular ballast does get very warm, but it is still good practice. It is actually a bit short for most guitars, which need 6 foot lamps (and I have since sold that old Kramer Ferrington to someone in Kansas via eBay). But it does give you an idea of the scale. For this rig, I just used a strain relief and connected a cord directly to the ballast. I would strongly recommend you install a box with a switch instead, but I use this mainly for long term testing, measured in days or weeks. The cord was an old computer cord that I chopped the end off off, as it was free and rated plenty high for one ballast. I am a bit of a cheapskate that way. Here you can see the actual frame, which is just 2"x2" pine, dirt cheap stuff, you just have to pick out the straightest ones from the bin. Be forwarded that you really need to predrill each screw hole when you are working with stock this small, and even then, you may crack wood if you get too aggressive with the screw gun. I made this frame EXACTLY 48" long. The lights are 47" and once you add the lamp ends, take up exactly 48", so I used 100% of the space. 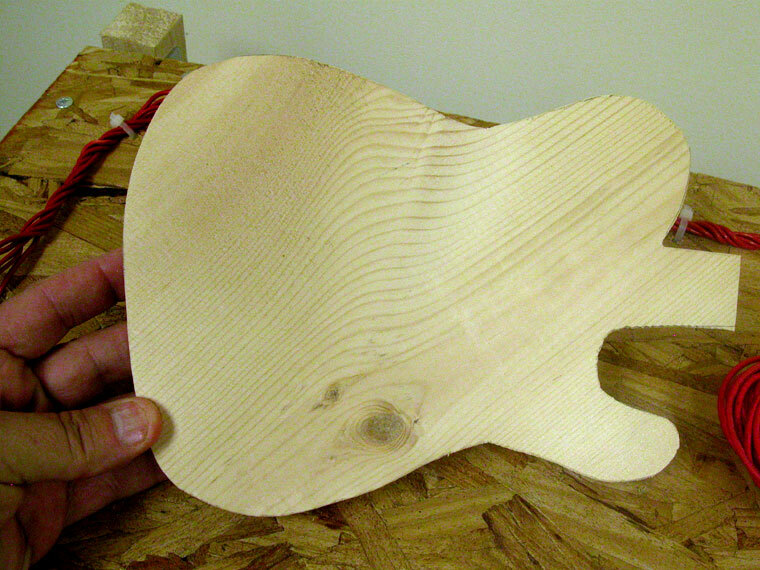 Note that wood isn't the perfect material for this kind of project, but it is very fast, cheap and easy to work with. As such, I expect most of you will use it. 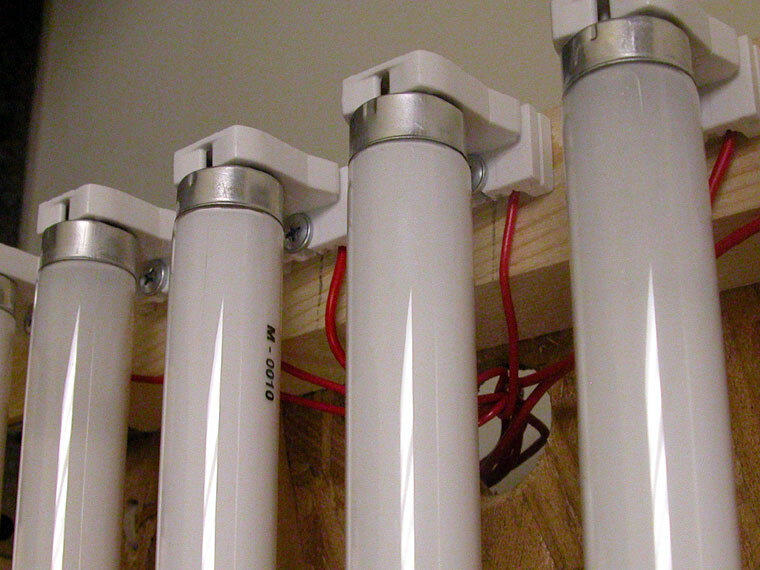 Here you can see the one side of the lamps where you put one red wire per lamp end. 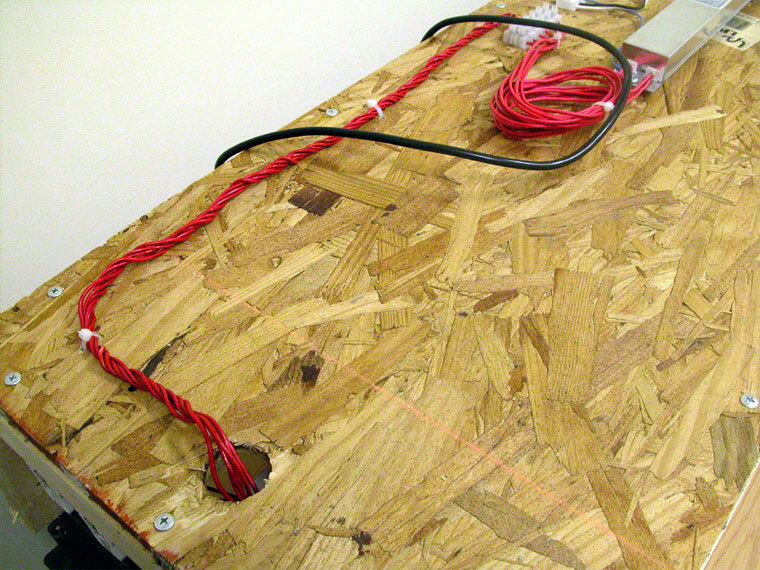 I used a hole saw to punch a hole in the OSB, so the wires can be run up to the ballast. This lamp end (Leviton, like we still sell, as they are truly the best) lets you feed the wire into the front of it, making it easy. The lamp end itself mounts with a single screw which goes into a slot, so you can adjust. The screw must be a flat bottom screw, preferably around 1.5" long, so you have an inch into the wood. I went ahead and spent the extra dollar to get really nice and wide screws just for this purpose. I've worked with many screws, I promise it is worth it. This is the part you probably will not do. The only reason I did is so I can swap out ballasts quickly. You normally do NOT want to add extra wire to the ballasts wires, and use only the wire that came with the ballast originally. I used wire ties as a strain relief for the power cord. 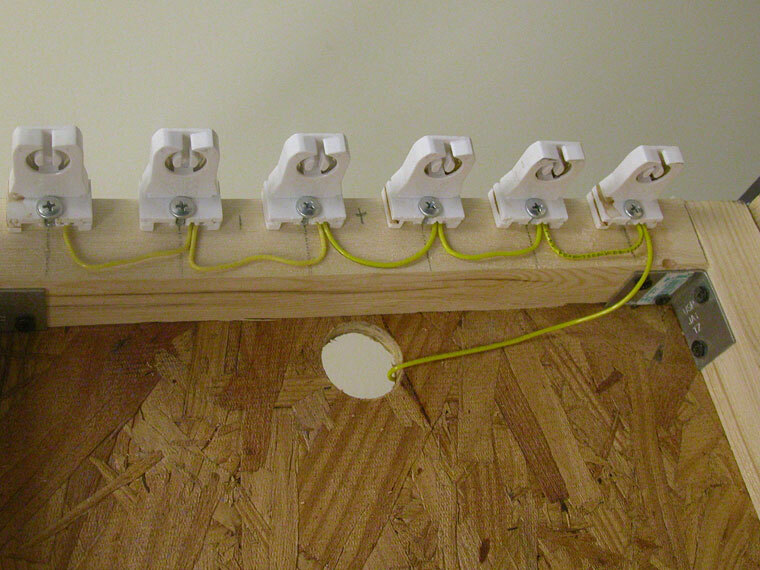 Normally, you would want to run this to a box, connecting the ground to the ballast case, the neutral straight to the neutral, and the hot from the ballast and the wall to switch. If you understand electricity, it is very easy. If you don't, you could injure or electrocute yourself, so get a buddy that does understand electricity, or hire an electrician. You don't have to get as fancy with your legs as I did, but I think these brackets cost about $1.50 each, and make it easy if I decided later to raise or lower the rig. They don't make it easy to do on the fly, just as a semi-permanent way. And they looked pretty. 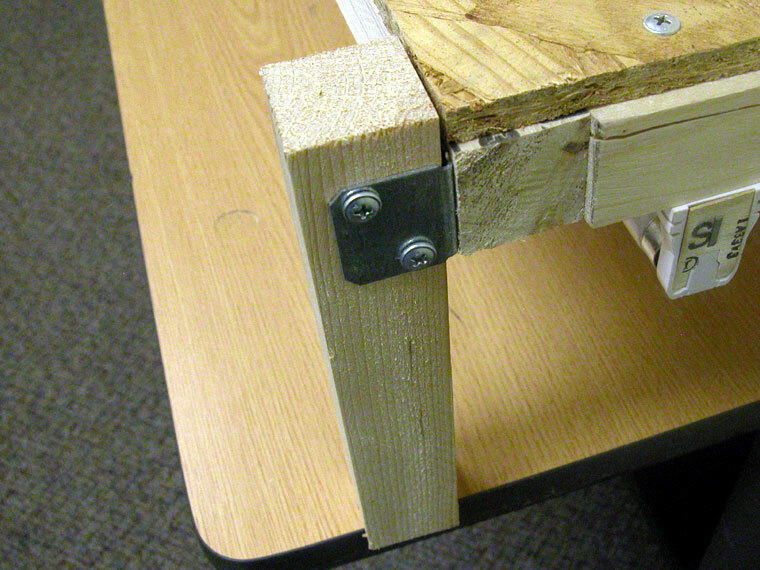 You can see here, I still cracked the wood when attaching the frame. Sometimes it just can't be avoided. Sometimes, you just use what you have, and we always have bags of wire ties lying around. To organize the wires, I just drilled two holes and fed the wire tie through it, then did it in several places. Simple, cheap and effective, plus it is easy to undo. 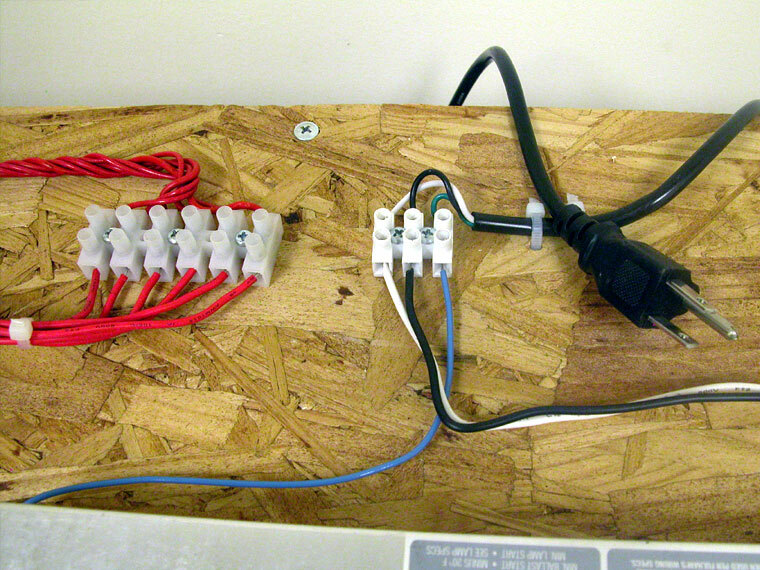 Almost all the ballasts we recommend are designed to "daisy chain" the wires on one end of the lamp. Keep in mind, the Leviton lamp ends we use and sell are internally shunted, which means both pins are jumped inside the lamp holder. So you are just jumping everything together. You MUST use solid wire, 18 to 22 gauge is fine, 18 is best. If you do it right, it will be more or less pretty and out of the way, like these. Note the use of L brackets on the inside corners. Probably isn't required, but I like a rig I can drop down a flight of stairs without it breaking. Well, the lamps will break, but the rig won't. Ready for my first series of tests. Something you should know, I (Dennis) am a pretty serious guitar player, and have been for over 4 decades, so it seemed only fitting to cut out small versions of the best guitar made, the Fender Telecaster, for testing. As you can imagine, the test went excellent and I did some testing with aging and curing UV resins with this rig. I can run this rig with either 4 or 6 lamps, although if you needed something similar, 6 is the best way to go as you can space them closer and get better results. The Workhorse 8 ballast used in this rig is my reference ballast, one that I have used for a ton of different rigs, and even in many thousands of tanning beds. It isn't necessarily the most powerful ballast we offer, but it is one of the most flexible and works for many applications that need moderate power. So there you have it, my personal UV curing rig. It was the first I built, took half a day and is still the rig I depend on daily for testing and aging wood. I'm a pretty handy guy, but I'm no carpenter, so if I can do it, you certainly can. In this rig you have about $25 in frame materials, $50 worth of ballast and $36 worth of lamp holders. 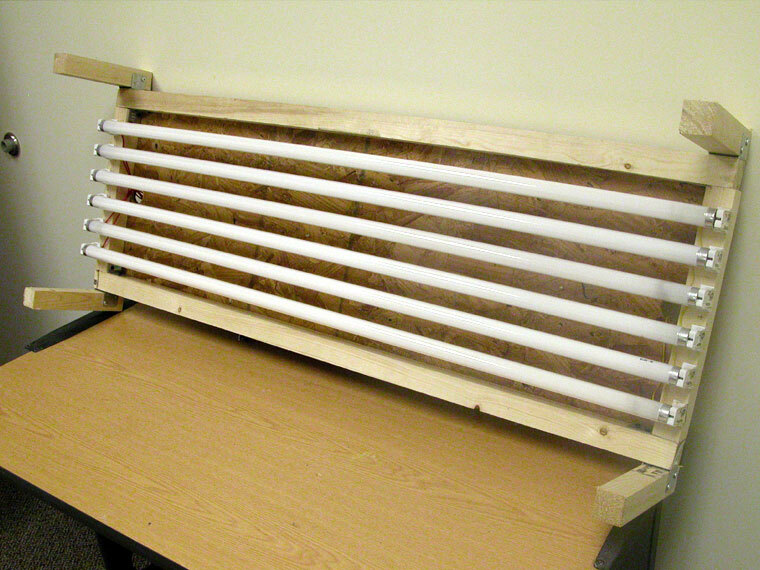 Just add the lamps and an old power cord and you are ready to start curing ultraviolet resins within the day.